On the back of increased interest for SimpliPHI products in mobile applications and improved pricing we have increased our stocks and reduced our price. 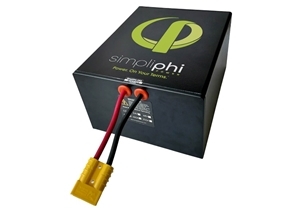 The PHI 1.3 is an ideal product for RV and mobile applications with proprietary architecture and Battery Management System (BMS) – do not require ventilation, cooling or thermal regulation. Compatible with all industry standard inverter/charger controllers. Drop in replacement for lead acid. LFP is the safest, most environmentally benign Lithium Ion chemistry available – no cobalt, no risk of thermal runaway or fire. No AC or toxic liquid cooling – nominal parasitic drain – long cycle life. Non-toxic and non-hazardous recyclable materials.